Ulster's clash with Toulon in the European Champions Cup has been moved from the Allianz Riviera Stadium in Nice to Stade Mayol. The Pool 3 game was scheduled for the the 36,624 capacity stadium in Nice but it has been switched to Toulon's traditional home, which holds 15,000. The dates and times for the final two rounds have yet to be confirmed. 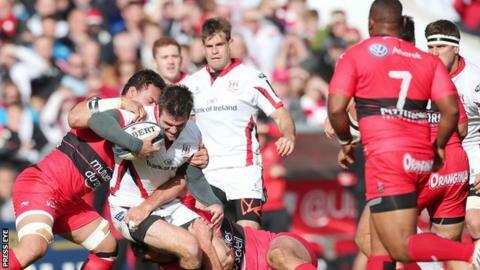 Ulster hope of progressing to the quarter-final were effectively ended with Sunday's defeat by the Scarlets. The Irish club have confirmed that it will be taking its full 10% allocation for next month's fixture. Ulster are bottom of the pool and six points behind the pacesetting French team.